With a good sense of reward I stood behind Chris and looked out over the dark blue lake called Reschensee. It was surrounded by snowy peaks on the other side of the Reschen pass we had just come over. We had made it over the white wall of the Alps that a few days earlier had stood massively between me and my flight home from Bologna. Now it was only a long ride downhill and into the warmer climate south of the mountains for the next six days. I took a deep breath and savoured the moment. As I stood there in my own thoughts two elderly men came over to me. We had just entered Italy and I realised that my language skills didn’t reach any further as we had left the German influenced language area of Europe. From now on, from Italy to China and beyond, I would have to depend on sign and body language when English was not spoken. The feeling of being travelling increased a level. So I was a little disappointed and confused when the men didn’t speak Italian but Austrian. Luckily I found that their Austrian version of German was too odd for my ears to understand, and as one of the men, Ferdy, spoke a little English, but couldn’t really hear much, a good portion of sign language was necessary in the end. Ferdy told me they lived here and that their culture was Tyrolean although we had crossed the border into Italy. I never knew of this Austrian-Italian area of South Tyrol before I now had stumbled upon it. I explained the trip we were on, they made big eyes and Ferdy’s friend (who didn’t reply when Chris asked about his name, so we will never know what to call him) asked in body language if we didn’t have suspension on our bikes. “No” we shaked our heads. Then, maybe being a little optimistic, I gave Ferdy one of our contact cards with our website’s address and our names. “This is our blog. You can follow us on our journey to China” I said, thinking it might be easier for them to understand written words and pictures. “No no no, I don’t want to go to China,” Ferdy said and refused to take the card, perfectly misunderstanding my invitation. He smiled confused, shaked his head and gave my arm a tight, friendly squeeze, then he and his friend with the unknown name walked away along their lake chatting in their singing Austrian language. Reschensee is a lake that was created when a river was dammed and flooded the valley. This had left a lonely church tower pointing up out of the water and this was now obviously a tourist attraction of the place. I’m not sure there was really a church underneath it anymore and the water level around the tower was kept higher than the rest of the lake by another little dam to make sure it still pointed picturesquely out of the water. It was still a strange and beautiful sight that was enhanced by the rapidly changing weather over the lake where grey clouds bringing swarms of snow flakes moved from the mountain tops down over the water to then crawl back up on the mountain on the other side. We took in the stunning views as we made our way around the lake and then the real downhill section began. We could still follow the Claudia Augusta bicycle route and it now led us on secluded bike paths and tiny roads through forest, lush green valleys and old villages. Around us mountains and raw cliffsides rose proudly in the sunshine. Further down the valley we encountered what seemed like endless rows of fruit trees full of white flowers. Since we were in Italy we figured it was vineyards, but after seeing some sign saying something about apples, we realised it was apple trees. Hundreds and thousands of them. They smelled fruity and fresh and I found it magical to roll effortlessly through the ocean of white flowers. On the second day a strong wind began to blow down through the valley from the mountains behind us, giving us a great tailwind that made the enjoyable cycling even easier. We hardly had to touch the pedals. In this style we arrived in Meran or Merano depending on your preference for Austrian or Italian. It was a beautiful old town built around the lively river decorated with mountain views to all sides. 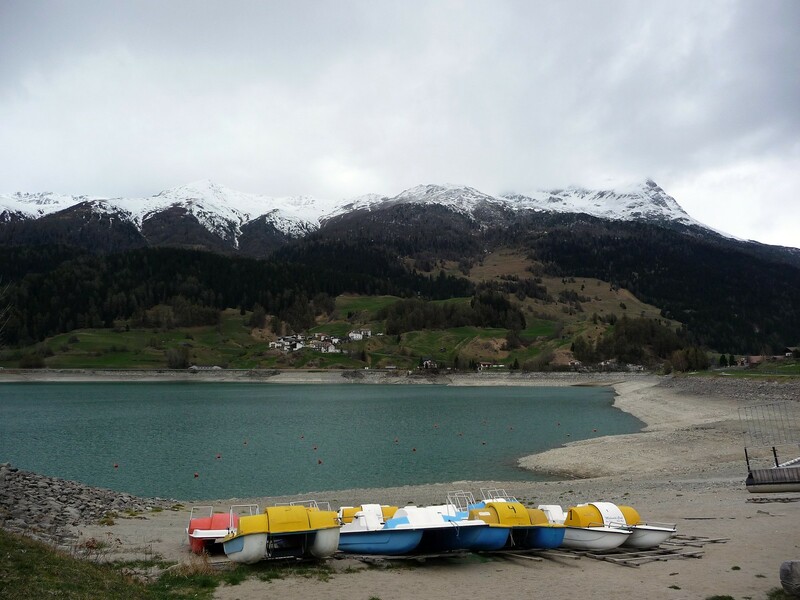 Some hundred years ago it had been a popular recreational place for wealthy people from the city that came here to gain health and vitality from the clear waters and the fresh alpine air. We had now understood that South Tyrol somehow was an autonomous region of Italy and apparently it was one of the richest in Italy. All the road signs were in both languages and I experienced the general atmosphere as a charming mix of Tyrolean nostalgia and Italian ‘laidbackness’ with many people being out and about simply to enjoy life and nature together. As we were curious about how this cultural mix initiated we watched this little video where a sweet young man from South Tyrol explains the circumstances and characteristics of the place he comes from, and if you, like us, had never heard of South Tyrol, I recommend you have a look. Bologna was still a good way away so we had to do some long days of around 100 kilometres to make it on time for my flight home. The tailwind helped us down through the valleys and so did also a game of Spotting Things Game, or at least it helped me as I finally won and this victory was a perfect 10’er + the SWAP that I could cherish already in the mid-afternoon. Chris was on the other hand suddenly motivated by a sign for Mori, the name of the town that marked his start and finish line for his circumnavigation of the planet. And it was only a few kilometres away! We hurried there, but found that it was not the right Mori, as the right Mori of course still lies in China several thousand kilometres away. Don’t celebrate just yet Chris. Wrong one. Though, one afternoon we suddenly felt we had travelled much further east already as we found ourselves in the middle of a big flock of sheep and goats that were being herded by two dogs and their strange looking herdsman in the middle of the cycle path. It was good fun to listen to the animals many different bleating voices and to watch the them being constantly on the hunt for something to eat while they were being pushed onwards by the flock and the eager, snapping dogs. As lovely as South Tyrol was for cycling, it was problematic for camping because all the land seemed to be taken up by the apple orchards and the river, roads and railway line that went through the valleys. But there is always somewhere where no one will look for two tired cyclists in a tent, and one evening we experienced just how close you can be without being seen simply because you are not expected there. Quiet and still we sat only a few metres from a construction area behind a row of trees we had found to camp in while we watched a man doing a lonely late shift without knowing that this evening the forest was inhabited. The next evening we were lucky to find a forest on a small hill. The ground was strewn with white boulders and slim grey tree trunks with light green needles high up in the air made it a beautiful place, but difficult to find a flat, hidden spot, but up at the top was a grassy field that did fine for us and someone had even left an unopened can of beer for us. After three days of what qualifies as perfect cycling we had to do one last climb to get out of the valley and after that the landscape changed abruptly to flat farmland with the mountains being only misty silhouettes in the horizon. Verona was the ending point of the Claudia Augusta bicycle route and it was really a shame that a route that had worked so well and had been so good, just kind of faded and disappeared in the end as the frequency of the sign posts lost its consistency the closer to the city centre we got. It was an anti-climax, and we were not the only ones finding ourselves lost in the busy streets. A German couple had cycled the same route as us from Landeck over the last week and now we went together into the city centre by help of the city maps that fortunately were put up in the streets. We said goodbye to them in front of the old fortress where they went to find their hotel, whereas we took a walk around the old city centre before we headed back out into the farmland to find a place to sleep. Every metre of the land was in use or fenced in and in the end and after darkness had fallen on us an abandoned building was what we got and it was quite fine. Not this abandoned building, obviously. This was in Verona. The last two days of cycling to Bologna we zigzagged south on small country roads avoiding the busy main roads that didn’t have a shoulder and where the Italian drivers tended to do very fast and very close overtaking. The landscape was flat, so flat that it almost felt like Holland, but in a different way, because the distances seemed bigger and also the many ruins of houses and barns that stood left was something you would never see further north in Europe. Here it didn’t seem so important to tidy up, move on, make use of every square metre and brick. Here things went slower, and in the afternoons we passed little village bars and ice cream shops lively with the locals taking a break from their work. The public clocks were not working and sometimes a digital display would show the temperature and date, but a wrong date, that a few times made me worry if we had picked up the carelessness and was a day late for my flight. But it was just the Italian way. The cycling was quite monotonous and my mind naturally began moving forward to the visits I was about to do in Denmark, mainly to my sister, her partner and my little nephew there, but of course also to the rest of my family and my friends around the country. It was such a surreal thought that this day I was cycling in Italy and the next I would be chatting away over an endless number of cups of coffee with my friends in Copenhagen. It was more than I could comprehend, and luckily I was distracted from these thoughts when Chris pointed at a big, brown rat-looking animal swimming in the canal we were cycling next to. It didn’t seem to be bothered by the audience, but proceeded with its swim as we stopped to look at it. It reminded me of the platypuses we had watched in Australia, especially when it suddenly dived and disappeared. We cycled on, Chris a bit ahead of me, so I was alone when I suddenly saw another one, or maybe it was the same, now sitting on the bank next to a pipe hole, again completely undisturbed by my staring. Chris came over to see it just as it crawled into the pipe, but for the next kilometre or so we saw several of them swimming in the canal and even one that ran across the road. I don’t know what they were, they looked like rats but were much bigger and fatter and with a white moustache like a walrus and they seemed to be the main inhabitants here. Late in the day before we reached Bologna we cycled intensely to get to a forest we had seen on a map and hoped would be a good place to camp. Unfortunately, we had ended cycling on a gravel road with a surface that grew looser and looser, so we ended up retreating to the bigger road. Here I discovered that my rear wheel was now bent, so that it rubbed against my brakes for every turn with a disturbing sound. My rim was very worn and thin and I had planned to get a new one and re-build the wheel in Bologna. It seemed to be just in time. With my back brakes detached and cycling on a bent wheel that I should later discover had a big crack in the rim, we made it into Bologna on the planned date. It was getting more and more hot for each day and we took many breaks in the midday heat, but we made our way into the city centre and found the nice bike path around the old city that took us to our host, Nicolò’s house. He was a warmshower host of our age and he had been so helpful to let me leave my bike and luggage at his place while I was in Denmark. He now helped us in and up the three floors to the flat he shared with some friends. Here he immediately offered us pasta and we got to know a bit about each other’s way of travelling and living, which in some ways differed, but in other ways synchronized surprisingly well when we found out we had all lived and worked in Surfers Paradise in Australia, only Nicoló had been there the year before Chris and me. Chris, Nicoló and his roommate Suzy went out for a walk in the city while I began to reset my mind to Denmark life by charging my travelling card, checking the train tables and repacking one of my Ortliebs to a shoulder back with the few things I would need. I was off for my two weeks of tour de Denmark.